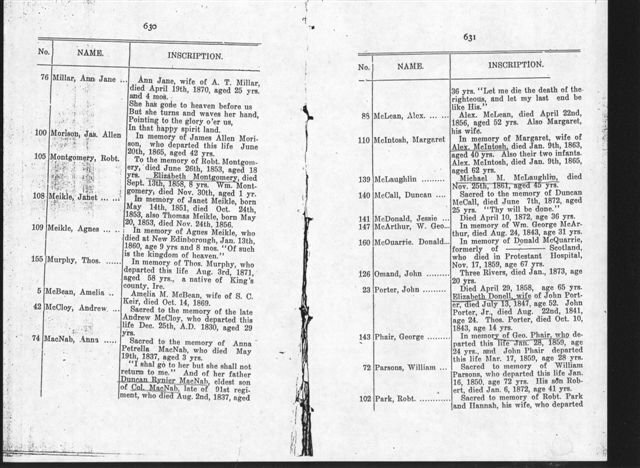 WERE RECORDED IN THE LIST RECORDED IN THE CITY OF OTTAWA MINUTES. YOU MUST CONTACT THE INDIVIDUAL LOCAL PARISH CHURCHES TO FIND OTHER NAMES. DO NOT E-MAIL ME ABOUT THIS. I HAVE NO FURTHER INFORMATION. contained sections for Presbyterians, Methodists, Anglicans and Roman Catholics. Beechwood and Notre Dame, which were in operation by the 1870's. 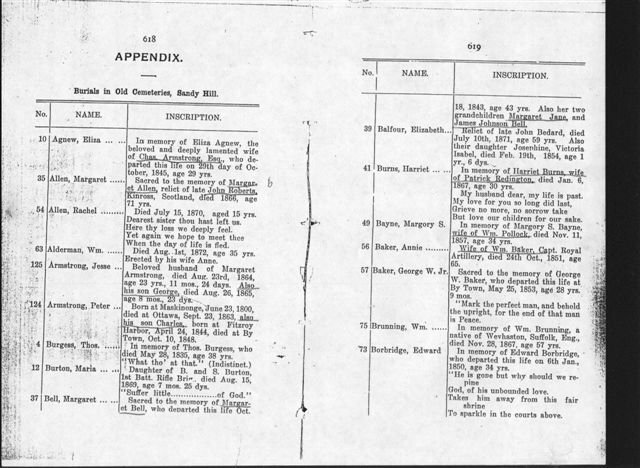 Source: City of Ottawa Archives, Minutes of Ottawa City Council. We spoke last Sat re subject. List is in Excel and you may want to edit to suit. can follow up at Ottawa City Archives where the minute books are located. I believe the Word Doc explains the listing. Wesleyan Methodist and Roman Catholic, each containing about 2 acres. They are detailed on a map in Belden's Carleton Co. Atlas, page 9. The Cemeteries were opened about 1845 and closed to burials 31 Dec 1872. About this time Beechwood and Notre Dame Cemeteries opened. 1925. At present there are two maps known to your scribe from the National Map Collection at LAC. 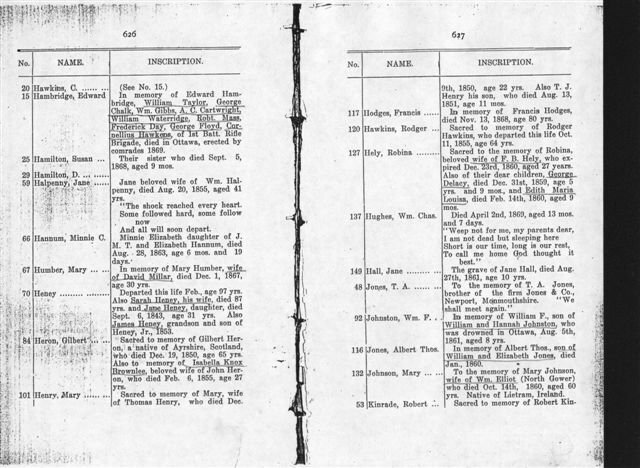 City Council Minutes of 1911. All data/info is listed in this database. Your scribe will entertain all enquiries and any additional info/data would be appreciated. Above references are not the only ones known at this time. Ottawa and was referred to as the Barrack Hill Cemetery. 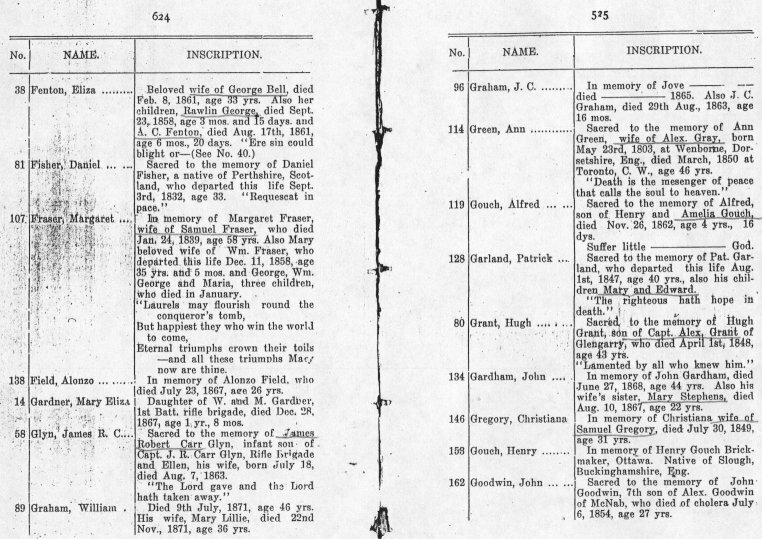 Allen			Margaret			35		d. 1866; age 71; bc 1795;  relict. Baker			John				133		d. 11 Jan 1865, age 65; bc 1800. Baker			Fanny				133		d. 11 Dec 1865; age 62; bc 1803. Blasdell		George				145		d. 11 May 1834; age 7y, 4m, 11d. Brasdell		Melissa E.			143		d. 14 Mar 1852; b. 15 Mar. 1840; d/o Thos. and Charlotte Br. Burgess			Thomas				4		d. 28 May 1835; age 38; bc1797; bro/o H.H. ??? Dyneley			Thomas Col. C.B. 61		Royal Artillary in Canada, Commanding? Foote			Mary Ann			34		d. 31 May 1864. Fraser			George				107		d. January ? 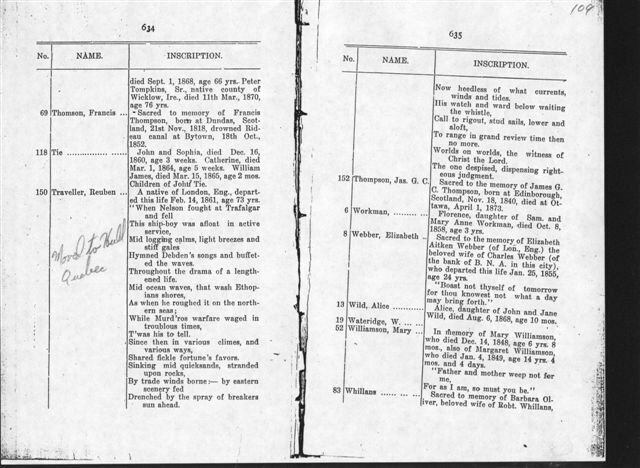 Fraser			William George			107		d. January ? Fraser			Maria				107		d. January ? Gardner			Mary Elizabeth			14		d. 28 Dec 1867; age 1y, 8m. Gardner			W.				14		Father? Rifle Brigade, 1st Batt. 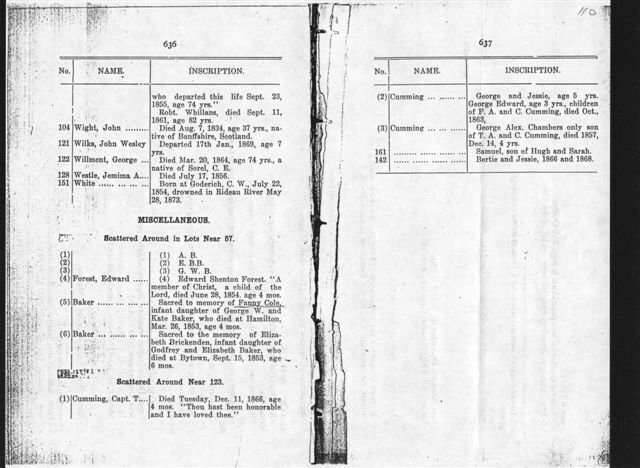 Glyn			J. R. Carr			58		Rifle Brigade, Capt. Heney			Sarah				70		d. ? ; age 87y. 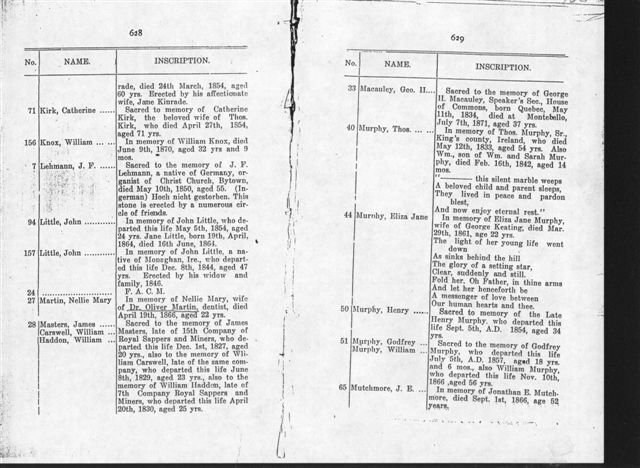 Heney			Jane				70		d. 6 Sep 1843; age 31y; d/o Sarah and ? 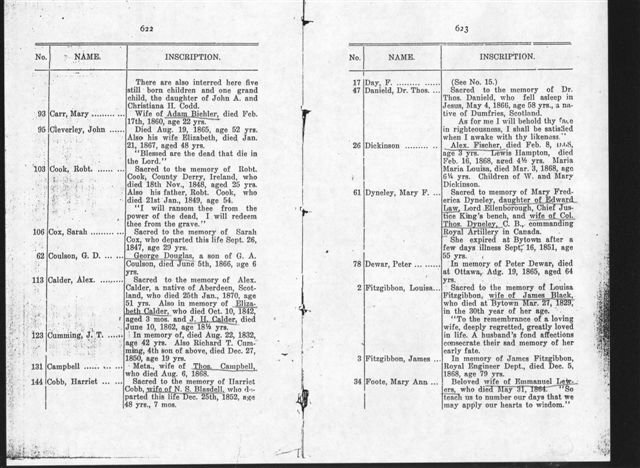 Heney			James  				70		d. 1853;  s/o Heney, Jr.
Kinrade			Jane				53		w/o Robert Kinrade. No Name			No Name				24		F.A.C.M. Stewart			Robert Sgt. 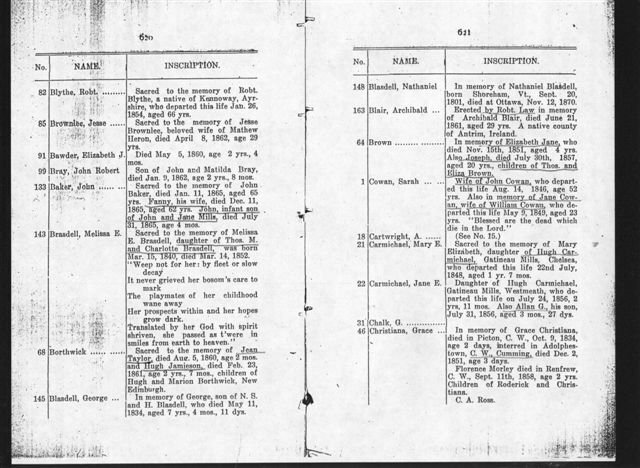 16		d. 15 Jul 1868; age 34y, 6m. 1st Batt. Band. F.C.O. Webber			Charles 			8		h/o Elizabeth A. Webber. of the Bank of B.N.A. this city? Willment		George 				122		d. 20 Mar 1864; age 74y. Native of Sorel, C.E. 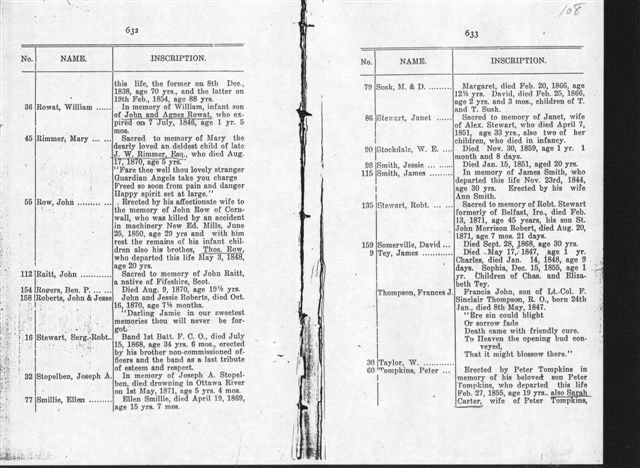 Above transcription is taken from 1911 City of Ottawa Minutes. Sandy Hill Cemetary is now McDonald Park near Rideau Street and Rideau River. 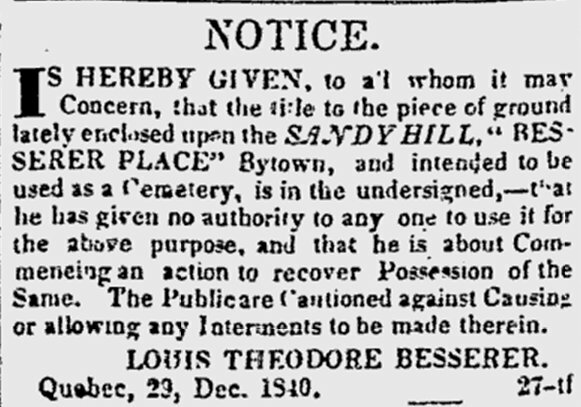 Lot 13 ½ South Part on 29 July 1876.
might want to add the following to one of your Sandy Hill Cemetery pages. The boys and girls around Macdonald Gardens, formerly the old cemetery on Sandy Hill, evidently enjoy gruesome play toys. boys with skulls in their hands. this stick.” This boy had a skull in his hand at the time and told the inquirer that he had nine more skulls at home. Some members of the improvement commission have been notified and will investigate the matter. be lost in stopping this rather unusual form of amusement. The boys evidently slip into the park unseen by the caretaker. generation of his family is buried. Another blog by Karen Prytula deals with the Sandy Hill Cemetery.